A new WMS video slot called Double Buffalo Spirit has found its way to online casinos. It takes the essence of the American Indians, their land and the animals and presents us with what is the true spirit of their heritage by way of this ground pounding slot game. By the name alone, you can vividly imagine the sound and sight of a herd of American Buffalo pounding the red dirt as they move across the horizon. You will see Eagles, Gophers and Lizards as part of the slot game. Those animals are residents of the American Indian land and are rightly incorporated into the new game. Wild Buffalo, prize multipliers and a free spin bonus round are not seen on American Indian land but are a part of the new game. 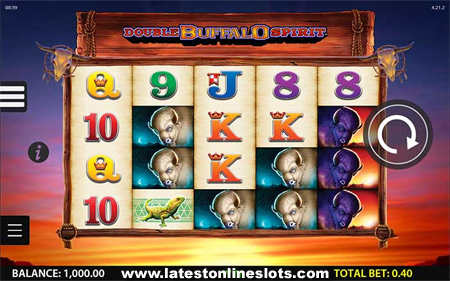 Double Buffalo Spirit is a five reel and 1024 ways to win slot game. If you are lucky enough to have your Buffalo turn wild, it will substitute for all the symbols except for the bonus round symbol. When three or more bonus symbols land in your reels, you will win 8, 15 or 20 free spins. You are able to win additional free spin by landing bonus symbols during your free spin games. Any Wild symbol that land in your reels during the free spins has the ability to change to a 2 times or 3 times multiplier. The stampede of Double Buffalo Spirit can be heard and felt at all WMS online casinos such as Slots Magic. If you can tame the Buffalo Spirit, you might walk away a big winner!